American Dream, Bearthoven’s sophomore release, is a reflection of the contemporary American state of mind. Rather than making a political statement, this music reflects the paradoxical nature of the ‘American Dream’ in our current era. 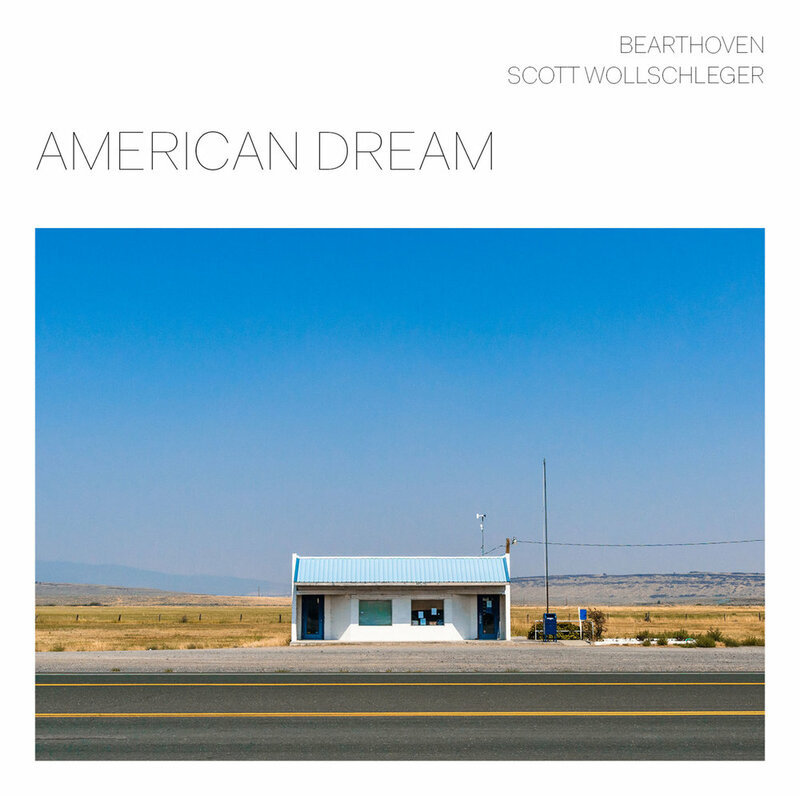 Consisting of three monumental new works by Scott Wollschleger, American Dream is available now in physical and digital formats on Cantaloupe Music and for concert booking. The full program consists of three pieces: Gas Station Canon Song for solo piano (2.5 minutes), American Dream for piano, double bass, and mixed percussion (35 minutes), and We See Things That Are Not There for piano and vibraphone (8 minutes). In a concert setting, these three pieces are performed attacca, drawing the audience into a prolonged state of listening, inviting them to contemplate the themes of the work. The title work, Wollschleger’s American Dream, is a substantial trio for piano, double bass, pitch pipes, and a wide array of percussion instruments including vibraphone, water crotales, and vibrators. The piece consists of numerous “broken songs” dispensed throughout a fragmented time-field. This formal dissonance, often heightened by disruptively recurring drone-clusters, sets the tone for the entire album: the beautiful/hopeful is pervasive but constantly shadowed by the repugnant/forlorn. ￼￼￼￼￼￼￼￼￼￼￼￼￼We See Things That Are Not There engages the vibraphone and piano in a constant repetitive dialogue with one another – both instruments recite the same phrase back and forth without an ultimate agreement. Gas Station Canon Song for solo piano is an unscrambled statement of one of the “broken songs” from American Dream. It was inspired by the synchronous existence of the beautiful and the grotesque encountered by Wollschleger in an I-80 gas station, a direct reference to a modern American paradox: how the majestic and the repellent always seem to coexist in a state of flux, no matter the medium. Streaming versions of the entire American Dream album are available on Bandcamp, Apple Music, and Spotify.